It’s not what you think—or is it? As a Solo Mom, a self-employed writer, and a divorcing spouse, I have a lot to think, worry, and wonder about. But more often than not, the thinking I find myself doing is not the productive kind. It is mindless brain chatter that serves no apparent purpose other than to stress me out. Take this morning, for example. To the uninformed observer, I was a woman standing at my kitchen sink, peacefully washing dishes. Would you look at all the leaves in that yard? How are you ever going to clean all that up? How are you going to take care of this house all by yourself? Everything’s going to fall apart. There aren’t enough hours in the day! Is that dry rot on the deck? Ugh. When’s the last time the gutters were cleaned? You don’t have the money to fix half of what needs to be repaired! How are you going to support yourself now, much less in the future? You’re 46 years old, and you have no retirement plan. And what about college for the kids? Forget the retirement plan; forget about college: you’ve got two kids in need of braces. Braces? How about just paying for routine dental visits? How are you going to do that? When are you going to stop loading money onto your credit cards and start paying them off? This whole dog-and-pony show you call your life? It’s balanced on the head of a freakin’ pin. Oh, God, what time is it? You’ve gotta make it to the grocery store, and write that article, and pick the boys up at school . . .
Yep. That’s what it sounds like in there. As a Solo Mom, my number-one stressor is my own brain. You’re going to fail miserably. Do I really, on a deep level, believe this about myself? No. Well, maybe the “too much to do” part, but the rest? Not at all. So why does my brain persist in a kind of thinking that raises my stress level, stunts my productivity, erodes my patience, and drains my energy? You know what? Forget “why”; it’s just another bottomless rabbit hole of thinking, thinking, thinking. Here’s the better question: When you find yourself caught up in stressful brain chatter, what can you do about it? What’s actually happening right now? 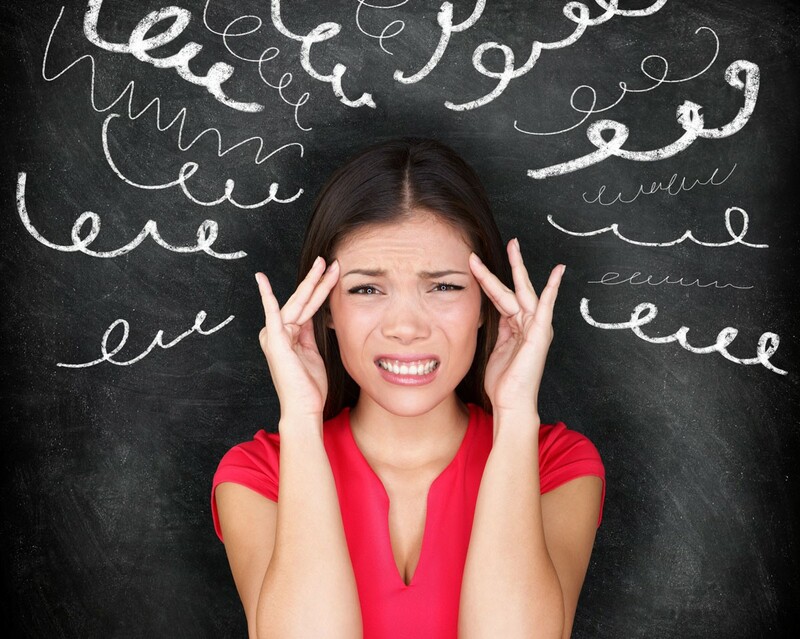 The stress mind thinks in broad, sweeping, often future-focused terms. When you notice you’re in the stress zone, you can rewire your thought patterns by asking yourself, What is actually happening right now? Are you an 86-year-old woman facing eviction because divorce washed out your retirement plan 40 years ago? No. You are standing at the kitchen sink washing dishes. That you can handle, and that’s all you need to handle right now. What can you do to take care of yourself right now? The stress mind privileges thinking, thinking, thinking over sensory, bodily connectedness. You can opt out of the imaginary sh*t show your brain is producing by spending even just a minute or two stretching your body or consciously experiencing a sensory feeling—the sun on your arms, the sound of the rain, your own breath expanding your lungs. What words will help you right now? I’m a big fan of affirmations. When I’m stressed about money, I tell myself I have everything I need. When I’m stressed about getting somewhere on time, I tell myself time will be kind to me. Instead of obsessing over what could go wrong, focus your mind on what is going right. Is this just a way of tricking yourself into a false sense of security? Perhaps. But it’s better than what your brain was doing before: tricking you into a false sense of insecurity. How can you cultivate more peace in your life? Warning—I’m about to use the M-word: through meditation. What solo parent has time for meditation, you ask? You do. Some people meditate for a set period of time every day—say, 10 minutes in the morning, before everyone in the house wakes up. Others practice meditation on an as-needed basis, like this: Next time you notice your brain chatter ramping up, take a moment to remember a specific time in your life when you felt at ease, relaxed, peaceful. Remember your surroundings at that time. What did you feel, hear, smell, see, taste? Draw on your body’s cellular memory of that experience. It’s still in there, somewhere, and now you get to call it forward into the present day. Pull that feeling into your body with your breath, inviting the peace in with each inhale, allowing stressful thoughts to melt away on each exhale. Seems ironic, doesn’t it, that a person who just admitted that she struggles with self-abusive, destructive thought patterns is now offering advice on how to cultivate more peace in your life? But that’s just the thing: there’s no endgame when it comes to taming a critical, fearful, judgmental mind. There’s only a practice: noticing the thinking, releasing the thinking; noticing the thinking, releasing the thinking. Some days it’s easier to calm my mind; some days it’s harder. But it’s never over, this practice. It is simply a way of living. The best we can do is to dedicate ourselves to compassionate awareness, noticing and releasing, loving ourselves when things come together and especially when things fall apart. Cheryl Dumesnil, ESME’s LGBTQ Resource Guide, is an author, educator, writing coach, all-around do-gooder, and one of two moms separately coparenting two amazing boys. You can follow her on Twitter at @cheryladumesnil. Could You Be Suffering from Love Addiction?